Blanche McCrary Boyd's first novel in twenty years continues the story of her protagonist Ellen Burns. When Tomb of the Unknown Racist opens in 1999, Ellen--now sober, haunted by her activist past and her failed relationships--is peacefully taking care of her demented mother in South Carolina. 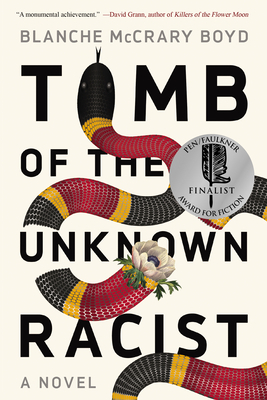 Tomb of the Unknown Racist is a thrilling novel set in the shadow of the Oklahoma City bombing, the subculture of white supremacy, and deep-state government. A family drama set against political and racial struggle, it is a tour de force end to a trilogy by a stunning writer whose work has offered a resonant survey of politics and activism across the American Experience. BLANCHE MCCRARY BOYD has taught at Connecticut College singe 1982. She has written four novels--Terminal Velocity, The Revolution of Little Girls, Mourning the Death of Magic, and Nerves--as well as a collection of essays, The Redneck Way of Knowledge. Among the awards Boyd has won are a Guggenheim Fellowship, a National Endowment for the Arts Fiction Fellowship, a Creative Writing Fellowship from the South Carolina Arts Commission, and a Wallace Stegner Fellowship in Creative Writing from Stanford University.